One must appreciate the optimistic nature of the wealthy American investor. Amid the longest government shutdown in the history of the United States, along with back-and-forth good news/bad news related to negotiations with China, newly discovered nuclear plants in North Korea, and whatever is going on with Brexit, investors decided to inch forward with investing plans after taking a deep dive in December. With the Dow Jones somehow reporting gains for three weeks in a row through the government shutdown, investors reported a slight improvement in confidence in the markets in the January Spectrem Investor Confidence Index. Among Millionaires, Stock and Stock Mutual Fund investing both rose slightly, although both remained well below standard percentages. Stock investing increased almost two points to 29.5 percent and Stock Mutual fund investing grew more than six points to 39.5 percent. Among non-Millionaires, Stock Mutual Fund investing rose to 28.1 percent, a point-and-a-half increase, but Stock investing fell three points to 15.7, matching the low back in August of 2018. Prior to that August reporting, Stock investing among Non-Millionaires had not been that low since October of 2013. Balancing that tiny bit of optimism was an increase in Cash investing by both Millionaires and non-Millionaires to near equal percentages, 25.6 among Millionaires and 22.3 among non-Millionaires. The Spectrem Investor Confidence Index survey was conducted Jan. 18-24, 2019, when the federal government remained shut down. Perhaps the best measure of renewed confidence comes in investors Not Investing, the category of investors who simply state their intention to maintain their current investment levels or decrease it. Among both Millionaires and non-Millionaires, those Not Investing dropped notably, indicating an increased participation among all investors despite the uncertainty of government operation at the time of the survey. Millionaires reported all more positive signs in January, although percentages remained uncharacteristically low. Millionaires reported maintained levels of investing or increases in all forms of products except Bond Mutual Fund products, where they dipped below 10 percent to 9.3 percent. The last time Bond Mutual Fund investing was that low among Millionaires was in July of 2016. Among non-Millionaires, Stock investing dipped while Stock Mutual Fund investing rose by nearly identical margins. 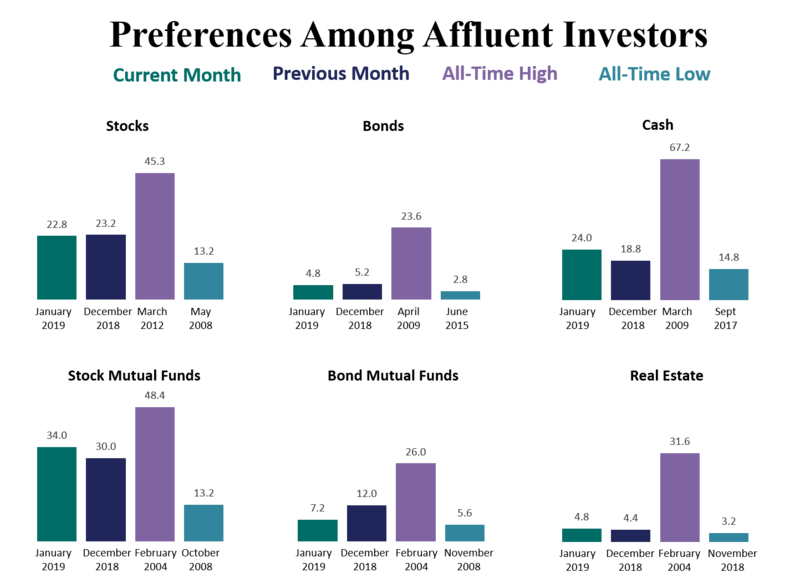 Individual Bond and Bond Mutual Fund investing among non-Millionaires fell dramatically, and individual Bond investing almost entirely disappeared, to just 1.7 percent. That marked the fourth consecutive month of lower involvement in Individual Bond investing among non-Millionaires. It’s not unusual for men and women to disagree, but the level to which that was true in the Spectrem Confidence index in January was stark. Among males, investing rose in all categories other than Bond Mutual funds, and those Not Investing fell almost 12 percentages points to 34.4 percent. Meanwhile, female investors dropped their investing percentages in Stock and Stock Mutual Fund products as well as in Individual Bond investing. The drop in Stock investing was by half, from 21.5 percent to 10.1 percent. Among females, those Not Investing rose slightly as well. However, both the Millionaire male and female index numbers dropped, with the female number doubling in negative territory from -7 to -14. Republicans liked what was going on in the stock market and Democrats did not in January. Republicans increased Stock and Stock Mutual Fund investing by six and eight percentage points, respectively. Democrats decreased investing in all categories involved in the Index, and halved their Stock investing from 29.50 to 14.70. However, the Republican indices both rose, and the Republican Affluent Index climbed out of negative range from -1 to 5. The Republican Millionaires Index rose from 1 to 8. The two Democratic indices both fell and remain in negative territory. Retired investors showed greater optimism than those investors working in January. Among retired investors, Stock and Stock Mutual Fund investing rose, as did Cash Investing. There was also a dip in those retired investors Not Investing further in the coming month, an indication of greater investment participation. Stock Investing among working investors dropped slightly, but that drop was matched by an increase in Stock Mutual Fund investing. Cash investing rose by almost 8 percent points, and those Not Investing fell by almost 7 points to 28.9 percent.